Easy and oh so cheesy! 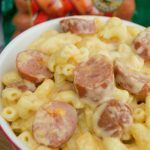 This Slow Cooker Mac and Cheese with Cheddar Smoked Sausage is a recipe that the entire family is sure to love. This recipe is a family favorite in our house. My husband loves it just as much as the kids do. He started off making the recipe years ago, and I knew if he was in charge of dinner that his homemade Mac and cheese with smoked sausage would be on the table. I can’t give him all the credit though I did work out a few things, and added a few ingredients and now this recipe is perfect. I mean it really is perfect, and the BEST Mac and cheese I have ever had. The best part, it is so easy to make! I started with cooked noodles and added cheese with half and half. 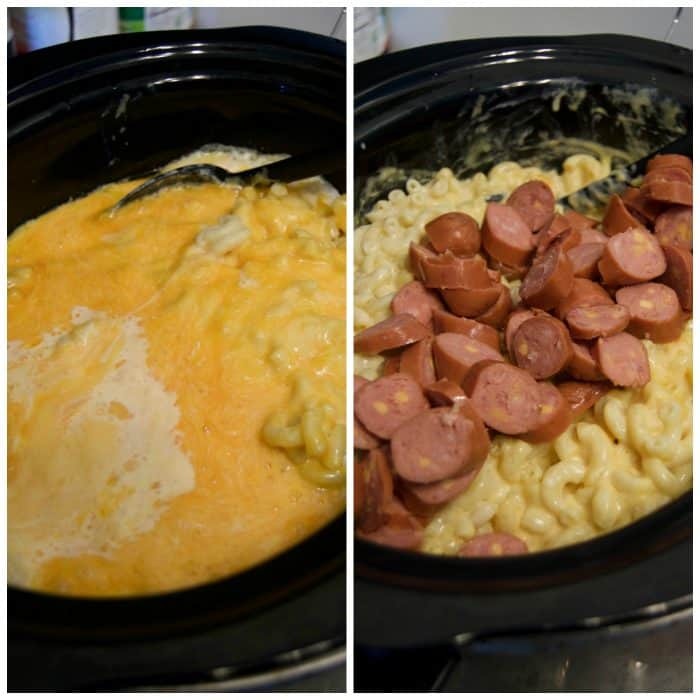 Let it cook until melted then add in the good stuff, 1 package of Eckrich Cheddar Smoked Sausage Links 14oz. I love using Erckrich because it’s Naturally Hardwood Smoked for the true smokehouse taste. 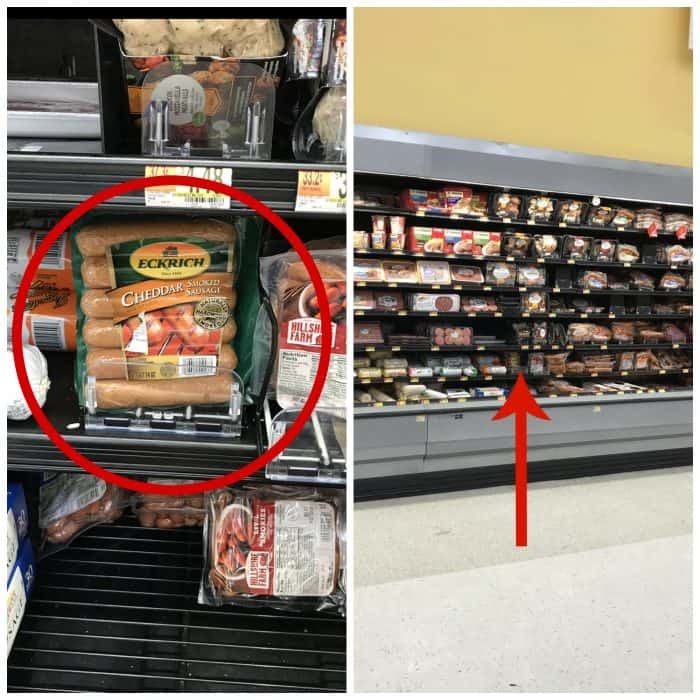 The flavor and versatility of Eckrich Smoked Sausage enables busy moms and dads to prepare a wide variety of delicious and satisfying meals with confidence in no time, and let me tell you as a busy mom myself I know! If you have little ones you know the struggle of keeping them at the table for a meal, and when I can find something we can all sit and enjoy together I feel like super mom! 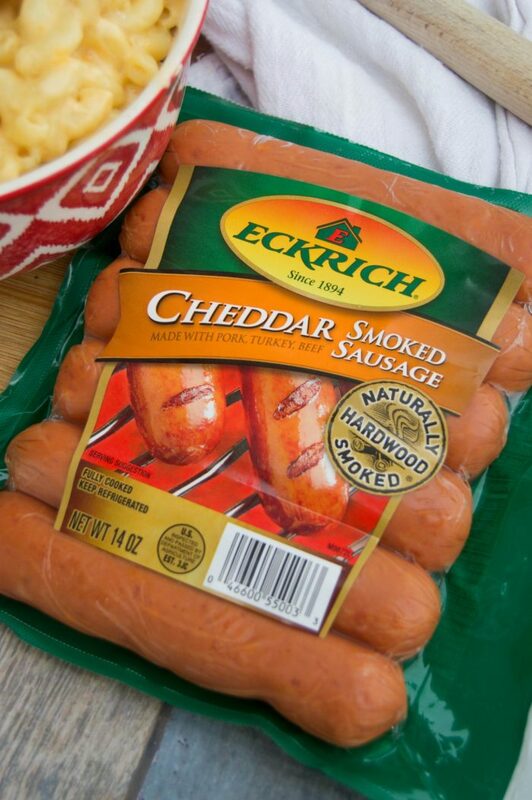 Eckrich products are a consistent family favorite in my house. 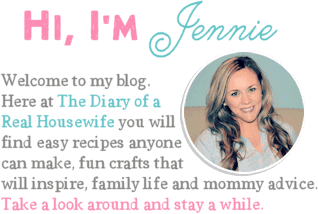 They take away the burden around getting the family to gather around the table at mealtime. 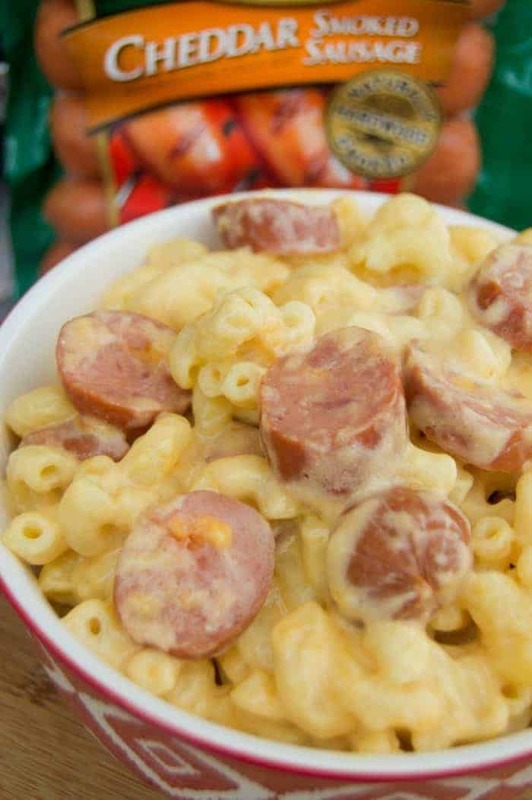 Amazing Slow Cooker Mac and Cheese using Eckrich Cheddar Smoked Sausage. You will love this classic recipe and these amazing sausage. Cook macaroni according to the packages directions. Drain and place in slow cooker. Cut cheese block into cubes and place on top of noodles. Add shredded cheddar cheese, butter, and half and half. Cook on high for 1 hour. Stir well until all the melted cheese has coated the noodles. 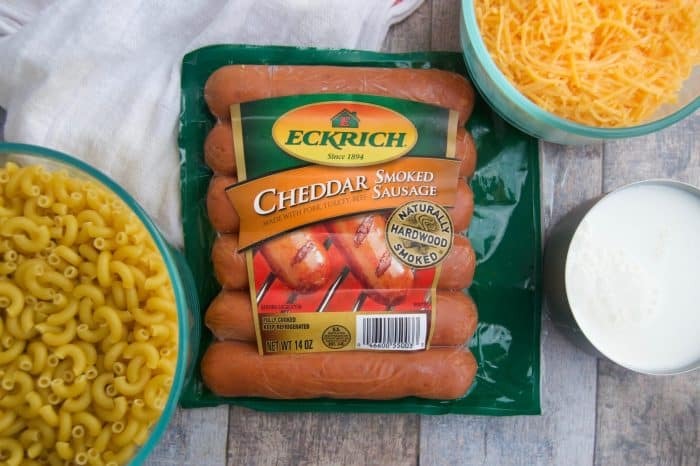 Cut Eckrich Cheddar Smoked Sausage into bite size pieces and mix in with noodles. Allow to cook for 1 more hour. Serve and enjoy the BEST Mac and cheese! 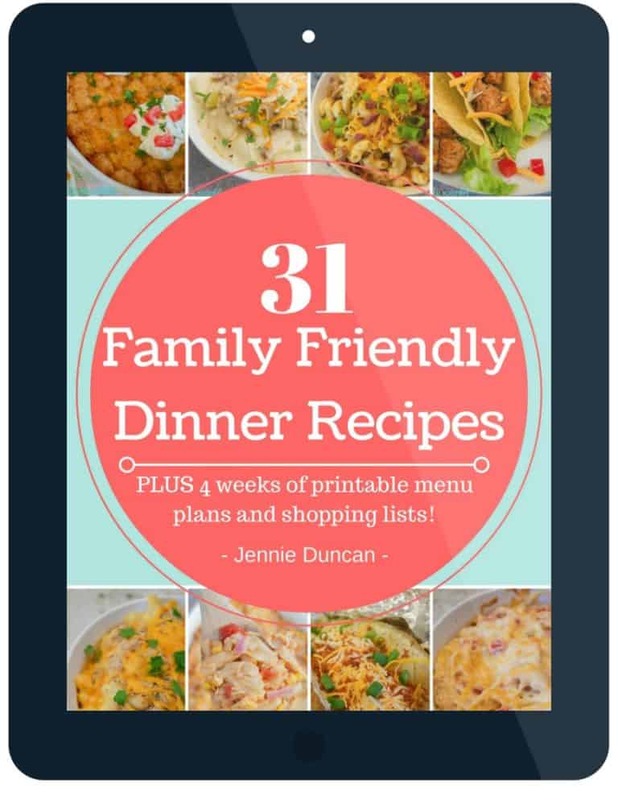 Make sure to stop by Walmart to grab your ingredients for this family friendly recipe. What variety will you be picking up to try? I used jalapeño Cheddar smoked sausage for a more spicy kick. It was good. I love that idea! I am a big fan of spicy food! Yum! I live in the UK, do you know what we would call the processed cheese block? For the life of me I can’t work it out. It’s basically the Velveeta cheese block! You only use 2 cups of pasta? I measured 2 cups and it seems like not enough compared to the 4 cups and 16 oz of cheese! Hi Jessica, yes it was 2 cups uncooked which made closer to 4-5 cups cooked. If you try this and find it to be too cheesy you can make some on the stove top and mix it in after cooking.